It depends on a number of factors, but the most important is if we are drawn to a crystal. If we're shopping online, for us pictures tell the story. We usually look for unusual specimens or truly beautiful pieces. A beautiful piece to us does not mean it has to be perfectly formed. If we can't stop thinking about a piece, inevitably we'll buy it. If we are in a physical store, its usually the pieces we can't put down that go home with us! If we're looking for a specific crystal/mineral type for a specific reason, its usually the piece we're most attracted to. On occasion if we are truly repulsed by the stone, we'll get it too, because we'll probably need it later! This question is frequently accompanied by blushes and giggles of those who ask! Size truly doesn't matter. Sometimes large pieces have slow almost lazy energy which is very soft, and a tiny crystal will just about knock your socks off. It truly depends on the piece and size is usually a personal preference. How do you work with the crystals? What reference materials do you use/recommend? We use a variety of published materials, such as Melody's Love is in the Earth and The Book of Stones. (See our bookstore for book recommendations.) We also do research online and of course use our own observations. How do you determine if a crystal is "male" or female"? Crystals really don't have genders. Their energy however can lean towards the masculine or feminine side, some more strongly than others. There are times where one will feel a female presence and another a male presence, but when you come down to it, its all the same energy. There are many crystals that just really don't have a defined gender "presence". Gender identity is really to make working with the stones easier for us. Also using he or she is a little more personal than using "it". Why do sites list different metaphysical properties for the same stone? What people feel from a stone or crystal really depends on personal experience. Our past experiences will flavor what we feel from a stone. Not to mention that the metaphysical information that people write are gained from using completely different specimens. While all smoky quartz have the same general properties, each will have slightly different properties due to their "experiences". What about treated, man altered , or man-made stones? First we'll address the treated, or man-altered stones. There are many ways to alter a stone from its natural state, besides polishing. Heat treating is one of the most common. Topaz, amethyst and quartz are frequently heated to change its color. Most commonly we see amethyst heated to create citrine. In precious gemstones, like tanzanite aquamarine, sapphire and ruby, they can be heated to make the color stronger, more saturated, therefore more valuable. Agate and howlite are frequently dyed, in the case of howlite to mimic turquoise. Stones such as aqua aura have had a precious metal bonded to their surface to change their exterior appearance and their overall energy. This process has expanded to encompass a variety of metals being bonded to quartz. The results are a veritable rainbow of opalescent crystals. This is a very harsh treatment, since a large number of crystals explode during the bonding process. In the past, we have avoided anything treated or altered as much as possible. We were truly not in favor of treating the stones in this way. For starters often more common stones are altered to mimic rarer stones. Citrine is far less common in nature than amethyst, which is why amethyst is frequently treated. The heated citrine appears as a different color than natural citrine, appearing vivid yellow orange to burnt orange in color, instead of hues of yellow gold. More frequently than not, these treatments are not disclosed to the public, which to us feels very dishonest. Not to mention the energies are completely different too. However, the more we work with the stones, the more we discover. These attempts to alter crystals don't always work. Dye leaches out of the stone, heating does not always result in a color change, and bonding process fails. Working with these altered crystals there is a sense that this is a conscious choice the stones have made. Treated crystals have their own roles and lessons. We are learning new appreciation for these altered crystal. However we do feel that these treatments need to be disclosed. Truly, when it comes down to it, it really is a personal preference. Man-made stones are a different matter. To us they lack the character and energy of natural crystals. We have a tendency to avoid them. Does polishing change the energy of the stone? In the most simple terms, yes. Does this mean its a bad thing, not necessarily. I've seen many partially polished crystals, that are such small touch ups its almost like they haven't been polished at all. Others have been transformed into a point, flame, sphere, cat, dolphin, etc. When a Master carves a piece you can be assured they are bringing out the inner characteristic of the piece. Here's a very interesting link to the polishing process of one incredible piece by a Master Carver. To Cut a Giant - By Lawrence Stoller (Lapidary Journal, Jan 2000). This may be an extreme piece, but it goes to show that Master Carvers & Cutters listen to the stones they are working with. Many stones, such as the giant in the article are covered in a thick crust that hides their inner beauty. Many times polishing and cutting is done to give a piece a new lease on life. What is the difference between a Boji stone and Mochi (Moqui) Marbles (Shaman Stones)? Moqui marbles (also known as shaman stones or thunderballs) are a completely natural formation. They are a compact sandstone balls with a metal crust. This outer shell contains a high iron (hematite) and other heavy metal content. Little is known about these stones and how they are formed. What scientists do know is this heavy metal shell displays a much higher metal content than is available in the surrounding environment. Most of them come from the Navajo Sandstone Formation in the state of Utah. Boji stones are created by humans from stones that were crumbling and dying. These stones have been infused with channeled energy and chemical (alchemy) processes. Is a crystal or mineral from one location the same as from another? Is location important? Crystals and minerals slightly differ in the chemical composition, locality, and their formation. Amethyst from India looks and feels much different from Amethyst from Brazil. Quartz can be found all over the world, but there are subtle differences between quartz specimens from Arkansas, Brazil or Madagascar. It is more than appearance that tell us that two crystals are from different locations as subtle differences in their molecular structure produce different energy patterns. Over time and exposure to their different energies, it becomes easier to recognize these differences. If you're familiar with sourdough bread, you'll know that each region that produces this bread has a unique taste, although inherently the same. Is a crystal's origin important? It's an individual decision and truly depends on what you are going to use a the piece for. Why are spheres so expensive? The price difference is due to availability of material, size of rough material needed to carve the sphere, and quality. Does the material occur in large enough quantities to carve? Is the material stable? All of these questions are a factor in the price of a sphere. For quartz, clarity is also a consideration. The aesthetics and quality of the sphere will also come into play in pricing a sphere. It takes a very large piece of rough material to make a 2" (50mm) in diameter sphere. The larger the sphere, the more expensive and difficult it is to obtain rough material large enough to cut the sphere. It also makes a difference to price if the sphere has been machine or hand cut. What is better for grounding, obsidian, black tourmaline or smoky quartz? Which is the strongest? Depending on what you need the crystal for, would depend on which one we would recommend. If you need grounding and protection, black tourmaline no doubt. If you are looking for grounding while you do metaphysical work, I would go for smoky quartz. Here's a little background on how their energy differs. Quartz and obsidian technically have the same chemical composition, however the crystalline structures are fundamentally different. Obsidian forms as an amorphous mass, with no organized crystalline structure. Quartz crystals however have very regulated crystal structures. This is what gives it its electrical properties. An energy passing through a quartz crystal (or any crystalline formation) will be stronger than energy passing through an amorphous mass. Obsidian is more of an insulator than a conductor. Black tourmaline has a regulated crystalline structure too, so will also transfer energy easily compared to obsidian. Obsidian is not strong when it comes to passing energy through it; however that does not mean that it is not strong in its own energy. It still has its own crystal vibration that is similar to quartz, just not as organized. Obsidian does not work in specific way as a quartz or tourmaline crystal would. Obsidian is considered strong in energy due to the amount of negativity it can handle, and how well it works to ground very high energy. Like smoky quartz it works well to ground when one is working with higher frequency stones like Moldavite or phenacite. What stones can I use to make an elixir? The purpose of an elixir is for the water to uptake the crystal vibration of the stone. There is some debate whether you should use polished or natural stones. In our opinion a more important consideration is if the stone is safe to use or not. Minerals such as cinnabar (a form of mercury) should not be used. Water soluble minerals such as celestite and angelite should also not be used as it will damage the stones. Care should be exercised when using stones with high metal content such as malachite, azurite, and chrysocolla. What will direct exposure to heat/sunlight do to my stones? What causes mist and planes in a crystal? 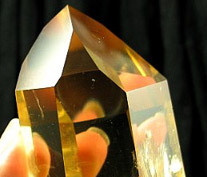 Mist or veils in a quartz point is caused by trapped air or water molecules, therefore it is unlikely that exposure to heat caused your crystal to become cloudy. However, over using the piece energetically can cause a crystal to become cloudy. Planes are internal fractures and are the source of amazing rainbows within a crystal. Are salt water baths good for stones? There is a lot of debate if salt is good or bad for your stones. What is actually more important to consider is water good for your stone. There are a lot of crystals and minerals that are damaged by prolonged exposure to water, and can even be changed by minimal exposure. Turquoise, celestite, and angelite are at the top of the list for being incompatible with water. Generally we only use water with quartz based stones and minerals. If in doubt use dry methods to cleanse and charge your stones. For more information see our crystal care page.